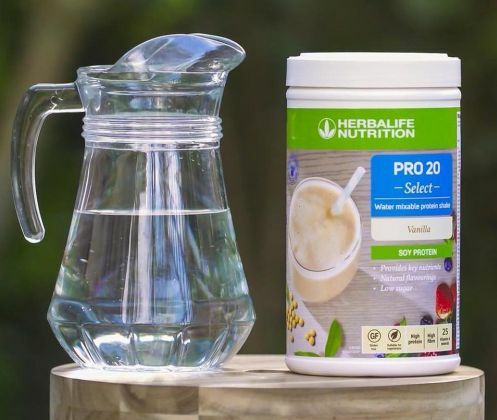 PRO 20 is a delicious water mixable, high protein shake) that is low in sugar and provides your body with key nutrients it needs. Each serving contains 20 g of protein, 6 g of fibre, and delivers a third of your daily recommended intake of 25 vitamins and minerals. Vegetarian, gluten and dairy free and no artificial sweeteners or flavours. It’s goodness without compromising on the taste. How is PRO 20 Select different from other protein shakes in the market? 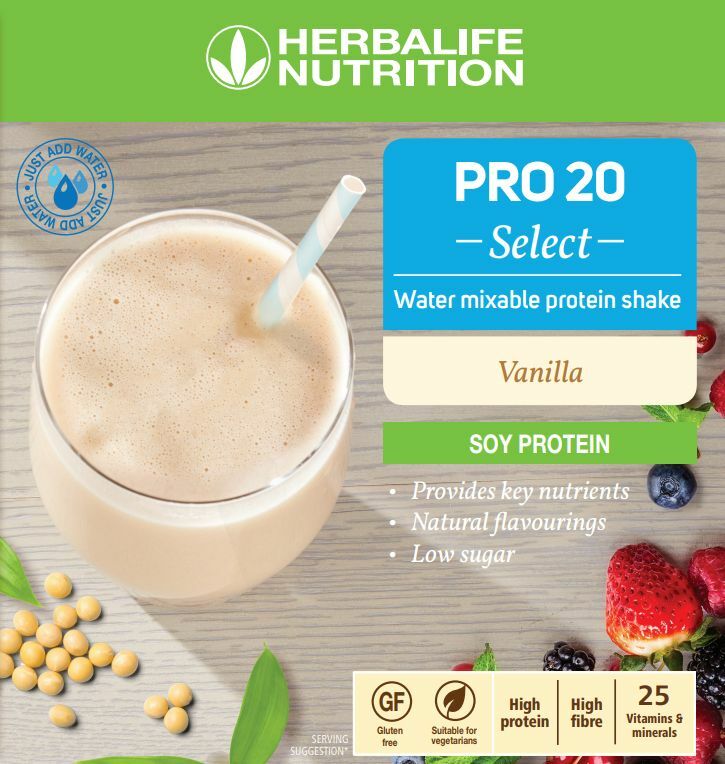 PRO 20 Select is not just a protein shake; it has added vitamins and minerals, high level of fibre and its low in sugars. So its an optimal selection of key nutrients your body needs. This post work out shake will make you feel less tired* and maintain energy* due to the amazing combination of vitamin C and B12. And you receive a personalised programme which includes your protein factor and resting and active metabolic rates which impact how many calories you take. We usually get hungry about every three to four hours, so several small snacks spread throughout the day may actually prevent you from eating too much at meal time. Snacks should be balanced, low in sugars and also nutritious. The afternoon stretch between lunch and dinner can be a difficult time. Many people try to tough it out but end up eating too much at dinner. Something like a protein shake could do the trick so you don't overdo it at dinner time. Proteins from soy are termed complete proteins because they contain a balance of all the essential amino acids (or building blocks) for the maintenance of muscle mass. * Vitamin B12 contributes to the reduction of tiredness and fatigue. * Vitamin C contributes to normal energy-yielding metabolism. More than just a protein shake: A practical and convenient solution to help you meet your protein, fibre, vitamin and mineral needs. Whether you’re looking to maintain a nutritious and balanced diet or need a healthy post workout snack, PRO 20 Select is the perfect solution for you. Personalised Nutrition: Make it any way. Use it any time in the day. PRO 20 Select is an ideal way to get protein throughout the day. It’s an ideal foundation to help you achieve your personal nutrition goals. Simple and delicious: Low in sugar and with natural flavouring, no artificial sweeteners or colours, gluten and dairy free. Including key vitamins and minerals, and mixes easily with water, making it ideal for a nutritious snack or protein boost on the go. Enjoy PRO 20 Select at any time during the day. Gently shake the canister prior to each use as content may settle. Mix 3 scoops (42 g) of powder with 250 ml of water. Upgrade your shake! Create any recipe combo you can think of with PRO 20 Select. Simply add your favourite veggies, fruits or nuts. (When adding fruits and/or vegetables or adjusting the amount of liquid, energy and nutritional values will be changed accordingly). Contact us for advice. All references to weight control relate to the Herbalife Weight Management Programme which includes, amongst other things, a balanced diet, regular exercise, an adequate daily fluid intake, nutritional supplementation where required and appropriate rest, individual results will vary. The products are not intended to diagnose, treat, cure or prevent any disease.